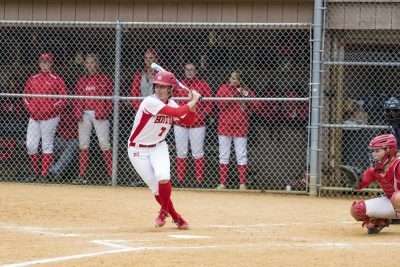 While spring break is a joyful time for all BU students, the Boston University softball team has it a little bit sweeter this March. Once classes finish up, the Terriers (4-4) will be headed out to California to soak in some sun and play 12 games over the span of nine days in two separate tournaments in Southern California. This coming weekend, BU is slated to challenge five different West Coast opponents in the San Diego Classic. On Friday, the Terriers will face off against California State University, Northridge and Santa Clara University at the University of San Diego. The team will remain at USD (9-8) to play Colorado State University on Saturday morning before traveling to San Diego State University for a matchup with the Aztecs (6-10). On Sunday morning, the Terriers will conclude the weekend with a tilt against Pac-12 competitor Oregon State University. BU has not played in two weekends, but carries a truckload of momentum on its plane ride west. On Feb. 17, the Terriers accomplished quite possibly the most notable win in program history, knocking off then-No. 1 University of Oklahoma 4-3 at the Troy Cox Classic in New Mexico. Even more encouraging for BU was that the upset victory was spurred by the bottom of the batting order. Senior outfielder Emma Wong and senior infielder Kaitlin Sahlinger, the seventh and eighth hitters against the Sooners (9-2), combined to fare 3-for-4 with four RBI and a run. BU received just two hits from the top four batters in the order, but it didn’t matter as Wong got the scoring going in the second inning with an RBI double before scoring on Sahlinger’s subsequent single. Oklahoma took a 3-2 lead with a two-run third inning, but the bottom of the order ignited the Terriers offense once again three frames later. Junior infielder Emily Morrow led off the inning with a single, and BU grabbed hold of the contest simply by putting the ball in play. Junior catcher and infielder Alexa Ponce pushed Morrow to second after an error by right fielder Nicole Mendes, and an error by senior pitcher Paige Parker on the ensuing Wong at-bat pushed Morrow across home plate. Sahlinger then shot a fly ball to center field to score Ponce and gave the Terriers a lead they would not give up. BU’s pitching staff also impressed at the Troy Cox Classic. Sophomore pitcher Lizzie Annerino locked the Sooners down, pitching 4.2 scoreless innings to close out the victory before allowing just two baserunners in three innings in a 2-1 loss to New Mexico State University the following day. Freshman pitcher Cali Dolfi was also composed in the defeat, lasting 3.2 innings on the mound without letting up a run against New Mexico State (9-5). Dolfi struck out three batters in the outing, her second such performance of the season. BU’s arms will need to bring similar confidence to the mound this weekend. The Beavers (10-6) pose the greatest threat to the Terriers over the five-game slate. Oregon State is on a mission to break into the NCAA Top 25, as it received eight votes in the USA Today/NFCA Coaches poll this past Tuesday. Last weekend, the Beavers nearly upset No. 12 Auburn University, one day after falling to No. 5 University of Tennessee. One thing in BU’s favor is they will avoid being matched up with No. 3 University of California, Los Angeles and No. 21 University of Minnesota. The two teams will be in the field at the San Diego Classic, but are not slated to contest the Terriers.